Moreover, you can use two different tooltips. For example, if you have some NPCs in your game, you may want to show "Talk" tooltip nearby them, but if you also have other objects with interaction capabilities (like road signs, wall inscriptions, etc. ), you can use different tooltip, so it will show "Examine" text or whatever. 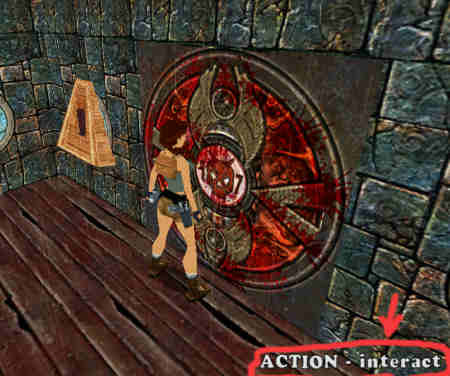 WARNING: update your STRINGS2.TXT file with two extra strings placed after "Lara's Diary" string, or else game will crash when you'll approach any of SECRET_MAP objects! If you still don't understand what i'm babbling about when i say "add extra strings to your STRINGS2.TXT file", just go and download sample STRINGS2.TXT file from TREP webpage, and look at the bottom part of this STRINGS2.TXT file until you'll understand what you should do, because i'm tired explaining such simple things . By default, each object uses first tooltip message (it's set to "ACTION - examine" in my sample STRINGS2.TXT). To show second tooltip message (set to "ACTION - talk" in my STRINGS2.TXT), add 20000 to OCB. Then it will show second tooltip instead. 1. OCB = text string number - produces "ACTION - examine" tooltip, show text in the bottom. 2. OCB = 10000 + text string number - produces "ACTION - examine" tooltip, show text in the center. 3. OCB = 20000 + text string number - produces "ACTION - talk" tooltip, show text in the bottom. 4. OCB = 30000 + text string number - produces "ACTION - talk" tooltip, show text in the center. Sorry for this complicated setup, it's all because stupid TR4 engine have only one 2-bytes long OCB . We really need secondary and tertiary OCBs for such objects. Last edited by Pyuaumch; 29-11-07 at 06:22.